Ok. Now that I’m using Debian again it’s time for Openvswitch. Building a .deb pack for openvswitch it’s very easy thanks to the readme files provided by Openvswitch and Nicira. I’m building the package as a non root user. I’ll create a directory and download OVS 1.10 version. After that I’ll use dpkg-buildpackage to create the debian package. Ok, now we’ll use our root account. Go to the directory where you’ve downloaded the openvswitch tar.gz file. We’ll install some debian packages and build the openvswitch kernel module. We’ll use gdebi to solve dependency problems when installing local deb files. It looks good. This one was easy…. I’ve posted about this topic again in case you really need to use Openvswitch 1.9 (LTS version), it worked for me but I can’t guarantee that it’ll work for you, I only try to help. I’ve installed recently the 1.10 version as it’s easier to install. Ok. CentOS 6.4 already has an openswitch module that you can load with: insmod openvswitch, but you’ll need the binaries to manage openvswitch. The first thing is to install the development tools. I use the groupinstall method though it’ll install libraries and compilers that you may not need…. but it’s a quick method. I also install the EPEL repository, uml_utilities and the OpenSSL development libraries. If you want to use the openvswitch module which comes with CentOS 6.4 and you only want to compile the tools to manage the openvswitch, let’s add an user ovswitch and switch to that user. Let’s download the files from OpenVswitch and build from the source. Now we are going to modify the openvswitch.spec so the openvswitch-kmod is not needed and you can install it later. Edit rhel/openvswitch.spec and remove openvswitch-kmod from the Requires lines. Finally let’s build the rpm file. Using our root account we’ll install the daemons and the utilities. Thanks to Nicira, Inc for the start/stop daemons. Compilation will show errors about ‘redefinition of…’. As this link suggests I’ve created a patch that comments the lines that prevents compilation but I can’t guarantee that it has no secondary effects and this is the first time I create a patch for rpm (thanks to these links: link#1, link#2). I had recently an issue when creating a port mirror, I don’t know if it was a problem with my solution but I think I should mention it. The new openvswitch module can’t be loaded if the bridge module is in use. If you don’t need the default bridge that is autostarted by the libvirtd daemon, remove the link that loads the bridge and the module. After that, restart the libvirtd daemon and check that the bridge module is not loaded. Warning: the default virbr0 bridge will dissapear. Now we want to prevent the original kernel module that comes with CentOS 6.4 to be loaded. Maybe there are better ways but I’ve chosen to make a backup of that module and substitute it with the new one. Check that the brcompat module has been loaded. I tested OpenNebula 3.8.3 with OpenVswitch and it worked with brcompat. Ok… it’s a long post and maybe you don’t need the brcompat module but who knows? Please I wish that my posts are clear and error free, I appreciate your help and feedback. Tthank you Adrian and Roni for sharing your issues and Arthur for your comment. this post has been rewritten (reloaded?). I’ve found a little spare time to update this article. A couple months ago I wrote a post about how to install openvswitch 1.9.0 version. It was a tricky installation and I even had to create a little patch, but with the latest stable 1.10 version the installation is a piece of cake. Only 5 minutes!. I’m showing you the steps after a clean minimal installation of CentOS. If you see # it means that the command must be executed as root, and if you see $ the command must me executed as the ovswitch user that I’ve created. Note that all this information is in the INSTALL.RHEL file that comes with the tar.gz file, but if you’re too lazy (like me) that’s what I’ve executed. I’d like to thank Openvswitch creators for such a great code and Nicira Inc for the daemon scripts. Great! The installation is quick and clean. P.S: If you need information about openvswitch installation for 1.9 version let me know (use a comment or contact me) because I’ve retired the old post info and I have a copy. 25/02/2014: Hi, I’ve created a new post for CentOS 6.5 but it may work also for CentOS 6.4, please visit this new post before. I’ll keep this article as an archived version if you need to compile wkhtmltopdf for any reason. 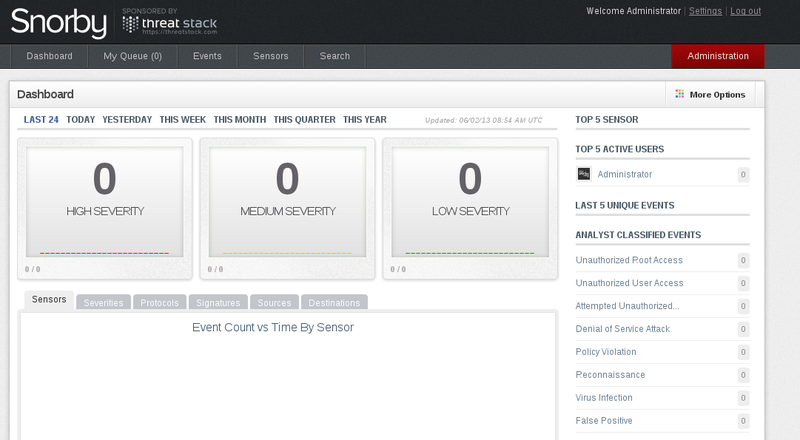 If I want to have fun with Suricata IDS I think it will be useful to have a monitoring tool to track possible alerts. I’ve chosen Snorby as it seems to have a nice and intuitive GUI. Snorby uses ruby on rails and a mysql database. After many attempts I’ve finally got it running so I want to share with you the steps I’ve followed. Unfortunately, packages in CentOS 6.4 repositories have older versions, maybe you can find newer versions in other repositories but time I’ll stick with the official repositories. Compilation fun! Warning: if you use the following commands check if newer versions of downloaded packages exist and change directories and names accordingly. Time for Wkhtmltopdf. I’ve downloaded the source files because I had problems with the static versions of Wkhtmltopdf. I’ve used the readme file (README_WKHTMLTOPDF) which comes with wkhtmltopdf as a guide, but notice that the gitorious repository is not found.Warning: this step is going to take a loooong time so if you don’t need pdf reporting skip it.Warning: if you see squares in your pdf report instead of text install with yum the urw-fonts package. This information is provided thanks to this stackoverflow question. MySQL!. Start the service and if it’s the first time you install it use the mysql_secure_installation to set root’s password and remove unnecessary tables. And now we need Ruby and RubyGems. I’m installing ruby 1.9.3 from ruby’s webpage. We now have gem installed and we’re going to install bundler gem which is needed by Snorby setup. OK. I want to use Snorby so I need to download it!. I’ve had problems with the latest git version of snorby so I had to use the zip with the stable version (which is linked from Snorby’s webpage). Now, pay attention! I’ve found many problems trying to use bundle with ruby 9.3 and I spent several hours finding out what to do. This is what I’ve done, I can guarantee that it’ll work with a newer ruby or snorby version but at least if you find the same problem you won’t suffer. If you find any error please contact me maybe I can help you and update the post so it’s useful for other users. //unless you want this error to show when using bundler: "error: /usr/local/lib/ruby/gems/1.9.1/gems/bundler-1.3.1/lib/bundler/fetcher.rb:112:in `specs': undefined method `each' //for nil:NilClass (NoMethodError)"
// Create a database.yml config file. If all is fine, open a web browser http://x.x.x.x:3000. Here, two screenshots so you can check that I haven’t lied to you. 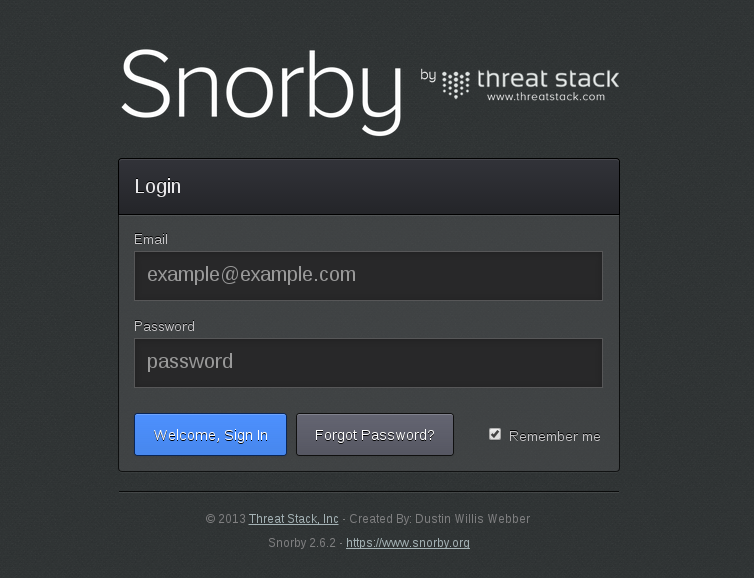 Snorby default credentials are: snorby@snorby.org and password snorby.